Over the years we have taught hundreds of students to become sound engineers and it's always good to share success stories and none more so than Johnny Pentecost. Having completed our 4 day pro live sound engineering course Johnny applied to work for Cunard on one of their flagship cruise liners that cruise the world 365 days of the year. Having gone through their rigorous interview process Johnny now enjoys the dream life, cruising the world and being one of the main sound engineers on Cunard's Queen Mary 2 and also Queen Victoria. Here he is behind a Digi-design desk on the Queen Victoria. Hi Howard, I hope you are well, just got back from Brisbane. Here is a photo of me at work. 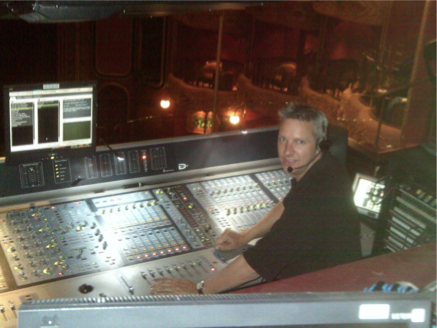 I am the Sound Technician (No.2) for Cunard and I work upon the Queen Mary 2 and Queen Victoria. The Queen Mary 2 uses a Yamaha PM1D console with 24 track RADAR system for Production shows which is time coded to the desk. We use Shure wireless beltpacks and Countryman DPA headset mics. The handhelds are Shure KSM 9. The desk on the Queen Victoria is a Digidesign D Show which again has fully automated snapshots fired from the MTC generated by the 96bit RADAR multitrack playback system. Hope that's ok, thanks again for all your support and encouragement over the years since I did the course.